Notes: Front Buckets and Rear Bench Seat Upholstery. Seat is Non-Perforated With Perforated Inserts As Original. This item is made for cars that came originally with factory cloth seats. Item does not have Map Pockets or Front Thigh Cushion. Includes Hog Rings, Hog Ring Pliers and Instructions. This is replacement seat upholstery; not slip on seat covers. Please be careful when selecting the color for your Mercury Capri Seat Upholstery. We have many color options to choose from, and some shades are very similar. If you are not 100% certain of the correct color, please allow us to send you samples by	clicking here. 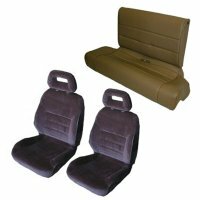 This Mercury Capri Seat Upholstery set is a high quality product following the factory pleat design, sewing pattern and factory attachment points. Item is made in material of your choice with head rests. Includes instructions, hog rings and hog ring pliers. Requires physical seat be removed from vehicle, old upholstery removed and new upholstery installed. This is replacement seat upholstery; not slip on seat covers.